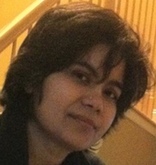 Usha is passionate about yoga and mindfulness. Her spiritual journey has all been about breathing, practicing, teaching and simply being. She has been a yoga and meditation practitioner all her life and continues to learn at every opportunity she gets. She believes that the quest for knowledge is never ending and prefers to be a seeker of knowledge for the rest of her life. Yoga grounded her and always helped her to live in the now. She has lived and taught Yoga and Meditation in the Philadelphia area since 2010. She has thousands of hours of experience teaching mindfulness practices full time. Usha continues her studies frequently in India where she is constantly expanding her knowledge, personal practice and sharing that with her students. She has learned that sharing her studies with others takes her own personal experience to a whole new level. Don’t they say that when you give, it gets returned back to you threefold? So true as she learns from each one of her students every single day. Thus with practicing and teaching she comes the full circle.